Built in 1933 during the Depression at a cost of $8 million, this public project provided sorely needed jobs for the architects, sculptors and various construction workers responsible for its creation. After the site was chosen in 1928, construction began in 1931 and took three and a half years to complete. In 1934, Mayor LaGuardia received a bronze key during the building's three-day dedication and celebration. Ironically, this might seem to cast doubt on its New Deal pedigree, since FDR did not become president until 1933, but before that he was the governor of New York State and had already begun the New Deal right here to provide work relief and build worthwhile projects, such as the Bronx campus of Hunter College (now Lehman College). The most likely source of funding was the New York State Temporary Emergency Relief Administration (TERA)[2,3,4], established by Governor Franklin D. Roosevelt on October 31, 1931, with Harry Hopkins as director, and later its president. Hopkins would go to lead the Federal Emergency Relief Administration (FERA) and the Works Progress Administration (WPA) during the Roosevelt presidency. I would argue that Roosevelt's New Deal began in New York State with TERA in 1931, and then when he became President, he expanded it to the nation as a whole. 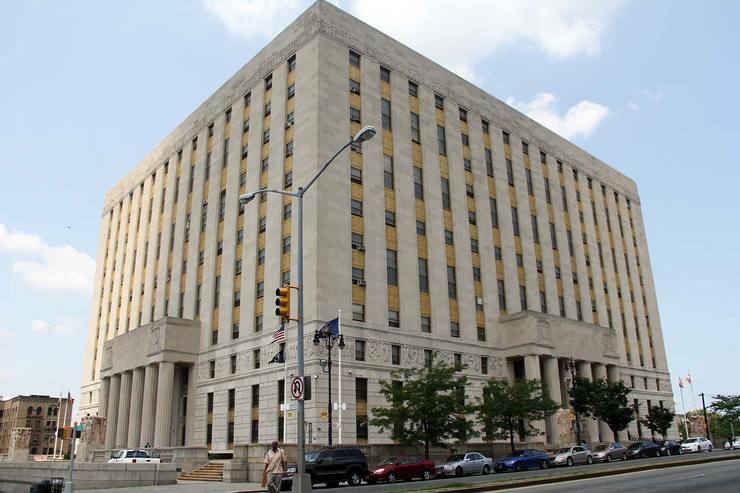 Mario Merola Building / Bronx County Courthouse, NYC Citywide Administrative Services website at nyc.gov. June Hopkins, Ph.D., The New York State Temporary Emergency Relief Administration: October 1, 1931, The Social Welfare History Project (undated). Publications of the New York State Temporary Relief Administration, 1931-1937, Volume 1 (628pp) and Volume 2 (634pp), NY TERA (1937), at Archive.org, the Internet Archive. Does not list specific projects, but notes in several places that it paid for the construction of court houses. Five Million People, One Billion Dollars: Final Report of the the Temporary Emergency Relief Administration, November 1, 1931—June 30, 1937. Mainly employment trends, statistics, and budgets; does not mention specific projects. However it notes that during a “typical period” (April 1935), 55.6% of work-relief man hours was spent on construction and improvement of public properties. Ultan, Lloyd, and Shelley Olson, The Bronx: The Ultimate Guide to New York City's Beautiful Borough, Rutgers University Press (2015), pp.44-48 (for details about the architecture, statuary, friezes, etc). The authors also note that the courthouse was paid for entirely by state and city (not federal) funds, but without giving any details. TERA was precisely the state agency that would have dispensed these funds, given that they were used to provide "sorely needed jobs".